Edwardsville Parks and Recreation's Annual Summer Ball Awards Night with the T-Bones is scheduled for Thursday, July 12. Each registered participant and coach will receive a FREE berm ticket to the game. Along with the game ticket, each player/coach will also receive a free tailgate meal in the left field parking lot prior to the game. Additional tickets are available for purchase for family and friends. Ticket upgrade options are available if you would like to upgrade your child's berm ticket to a select seat for just $4.50. To order tickets, please CLICK HERE! Ticket orders must be placed NO LATER than Sunday, July 1. FALL Soccer League Registration Opens July 1! EDW Parks and Recreation's Fall soccer league registration will open July 1. Registration for soccer will remain open for the entire month of July. Payment in full must be made at time of registration. To register after July 1, CLICK HERE! Edwardsville Parks and Rec to Host Winter Basketball League! EDW Parks and Recreation will be running a Winter Basketball League in cooperation with Turner Rec beginning with practices in November. To register, click not the REGISTER button at the bottom left of the HOME page. 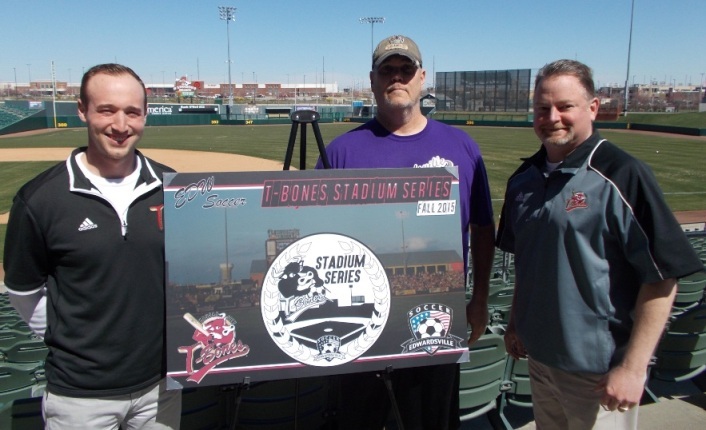 EDW Parks & Rec Soccer Partners w/T-Bones: Stadium Series Announced! Edwardsville Parks & Rec is excited to announce a partnership with the Kansas City T-Bones Baseball Club that will bring the T-Bones Stadium Series at Community America Park to the soccer program in the fall of 2015! Teams from the Edwardsville, Basehor, Piper and Turner soccer leagues will play a league game on the Community America Park outfield that will hold 2 soccer fields that play simultaneously. Edwardsville Parks & Rec has been working on this event since November of 2014, and was just finalized today, Monday, March 31, 2015. The Parks & Rec staff would like to thank the Kansas City T-Bones Baseball Club, GM Chris Browne and Stephen Hardwick, Assistant Director of Group Sales for their perseverance and flexibility in bringing this event to fruition. Register online for our programs and activities! Click the 'Register' below to register and/or access your account. For special event information, choose the event of interest from our 'Special Events' menu. Our special events include Arts & Crafts, Trunk-or-Treat for Halloween and the Mayor's Christmas Tree Lighting. Like to referee for us? Check out our referee/umpire page for additional information. Edwardsville has a number of parks spread throughout our town. Click below to find out more about the parks and their location. All games for Saturday April 29th have been cancelled.